Woo hoo, says Beel! If you ever want a case history of how not to exploit a public resource for personal profit, you need to study the Professional Tarpon Tournament Series (PTTS) and its interaction with the public, particularly Save the Tarpon. This is all wonderfully documented on Save the Tarpons’s website. Amid growing concern that its live-release tournaments were conducted in a manner that was inconsistent with post-release survival of tarpon, the PTTS pressed on, dismissing its critics. The story goes back a bit farther, but Beel will pick it up from last summer (2012). In June, the PTTS was criticized for the manner in which its tournaments were held, PTTS vice president and tournament host Joe Mercurio defiantly stated that the Tarpon Tournament Series would continue practicing gaff, tow and weigh until “someone” told him to stop. In September, as the Florida Fish and Wildlife Conservation Commission begain to consider ending tarpon possession, the PTTS changed its postion: “We will no longer allow teams to gaff, tow, and weigh in their catch. Rather, weights will be determined by a measurement of the fish’s length and girth,” tournament host Joe Mercurio pre-emptively told the seven-member commission, in an attempt to prevent any serious regulation of tarpon fishing. This concession was too little to late, the ball was already rolling. Save the Tarpon has a screen capture of the exchange. And they have some mashed up photographs as well (see below). Nice. Earlier this month, on 13 February, the Florida Fish and Wildlife Conservation Commission voted to move forward with plans to put an end to “gaff and drag” fishing by making tarpon a catch-and-release only species. Since that time, several of the PTTS’s sponsors have abandoned them. One of the first was Tires Plus Total Car Care Inc., through its parent company Bridgestone/Firestone. 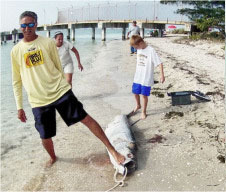 This followed the publicizing of a photograph (see below) of PTTS co-owner Rodney Taucher standing on a dead tarpon while wearing a shirt with a Tires Plus Total Car Care Inc., logo. In the past week several additional sponsors have severed ties with the PTTS. These include Skeeter Boats, Andros Boatworks, Costa del Mar Sunglasses, and most recently Farlow’s On the Water, the only local business still affiliated with the PTTS. So where did the PTTS go wrong? In a nutshell, they were arrogant and filled with hubris. They were exploiting a public resource. Rather than engaging the public and seeking a way to alleviate their concerns, PTTS blew them off and created an adversarial situation. Basic public relations- in a controversy you seek common ground. Concern for the resource might have been such a common ground, but evidently it wasn’t. They made needlessly provocative statements- in public and online- and were repeatedly videoed or photographed doing things that were not in their own interest. Finally, they ran up against a motivated public that watched them like hawks, documented their misdeeds, made some great mash ups of photographs (they fought dirty- Beel loves it!! ), and simply allowed PTTS to do themselves. A classic case history. Beel gives Save the Tarpon three stars- Beel’s highest recognition. 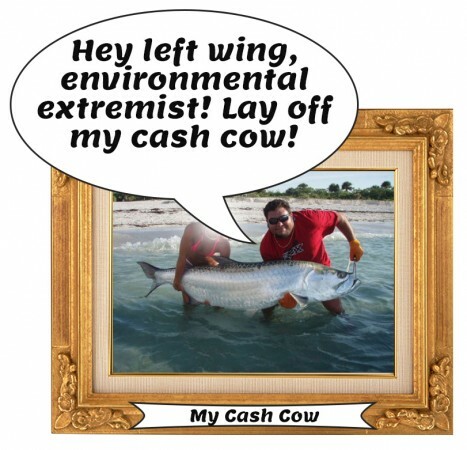 Beel published on the PTTS and Save the Tarpon a couple of weeks ago. This entry was posted on February 27, 2013 by denstormer in Beel Recommended, Commentary, Fishing and angling and tagged fishing competitions, marine fish, USA.